You always have the best of intentions with your skin care routine. Each day, you drink water, you cleanse, and you prime. You are doing a lot of things very, very right. Unfortunately, even with a dozen great habits – chances are there’s some really terrible ones sticking around for the ride. It’s a typical problem, we run to the gym without enough time to take off makeup. Working out with makeup on can cause a buildup of excess oil and a higher risk of clogged pores. Certain kinds of makeup contain oils that are more likely to clog pores along the forehead, nose and chin area. “Sweating opens up pores and when there’s a layer of makeup on top of it, combined with dirt and bacteria, it can lead to breakouts categorized as acne cosmetica,” says Dr. David Bank, a dermatologist and author of Beautiful Skin: Every Woman’s Guide to Looking Her Best at Any Age and Founder & Director of The Center For Dermatology, Cosmetic & Laser Surgery in Mt. Kisco, New York. Either go to the gym with a clean face or remove makeup prior to working out to reduce chances of clogged pores. People tend to pick away at them, thinking they will disappear but unfortunately the scar still remains, they are just picking away at the scab underneath. “For smaller scars caused by shaving nicks or deep scratches that are less than six months old, use an at-home silicone cream to help flatten and remove redness. The cream should be applied twice a day for two months in order to get the best results. For more substantial and older scars, the best recommendation is to have at least four sessions of vascular laser treatments or a Fraxel laser treatment to help reduce the scar itself and restore the skin to its natural color,” says Dr. Bank. The skin on your neck and chest is just as important as your face, and equally as delicate. “Any anti-aging product you use on your face should also be used on your neck and chest!” says plastic surgeon Dr. Joseph Rucker. You are what you eat! You’d be surprised how much impact dairy has on the skin. Inflammation-causing dairy can wreak havoc on cystic acne sufferers.”Your best bet: Un-sweetend Almond milk. My personal favorites: Silk Un-sweeted Almond Milk or West Soy’s Un-sweetend Organic Vanilla Soy Milk,” says Jolie Martin, corrective skincare expert at SKINNEY Medspa. There are many reasons for not picking pimples. It can lead to scarring of the face and if aggressive enough, you will end up with pock marks or hyperpigmentation (dark spots) on your face. “At the very least you will scab your face which is more difficult to hide with makeup than the original blemish,” says Gabriela Santana-Blackburn, Executive Director of Esthetics and Teacher Training at Tricoci University of Beauty Culture. All that pressure on a pimple that is not ready to be extracted can lead to a rupture below the skin surface, which in turn will lead to more breakouts. This can turn into a vicious circle that will lead to your skin never being clear of the problem. You are better off leaving this to professionals who know how to extract properly without the adverse effects. Exfoliation is a wonderful thing for your skin but too much of a good thing is definitely bad. Over-exfoliating can lead to irritated and flaking skin. This makes putting on makeup a nightmare and can also lead to sensitivity issue. “Sometimes our guests can’t get the facial they need or want because their skin is simply too sensitized and everything burns. We have to soothe the skin and get them to stop exfoliating so that we can do more,” says Santana-Blackburn. Exfoliating at home is best done no more than a couple of times a week using a scrub (with smooth beads and not rough ground shells) or a gentle enzyme or acid peel. Extreme heat from the blow-drier can leave you with broken capillaries, which can become permanently broken over time, says Dr. Rucker. No matter how tired we are after a long day at work or going out with friends, it is really important to take the time to care for your skin at night. If you have an acne/ oily skin, it is imperative to wash away all that excess oil that your skin produced during the day – not to mention all the makeup that was applied and worn during the day which can lead to clogged pores. You also want to wash away all of the pollutants that skin is exposed to during the day – this is especially important to maintaining youthful skin. Over time, this can lead to sagging, fine lines and wrinkles. Practice good posture and avoid the chin rest. in eye makeup remover. Avoid rubbing itchy, tired eyes and instead use eye drops to alleviate the dryness,” says Beverly Hills Aesthetician, Gina Mari. The surrounding eye area has the thinnest skin on the face, and it’s the first to show the signs of aging. Pulling on the skin while putting in contacts, applying eyeliner, or rubbing aggressively to remove stubborn eye makeup can unnecessarily create wear and tear on the collagen and elasticity fibers within the skin. “This can cause visible lines and wrinkles prematurely, so be sure to handle this delicate area with care. Also, always apply eye cream with the ring finger (it’s the weakest) and use a gentle patting motion to avoid rubbing and tugging,” says celebrity esthetician Renee Rouleau. This habit can cause unwanted fine lines and wrinkles so always try to fall asleep on your back to avoid unsightly lines that could have been prevented. We all know smoking takes a toll on skin, but many people don’t realize how much. Smoking is the most common cause of wrinkles around the mouth, often called smoker’s lines. Drinking from a straw can create similar lines if the motion is repeated enough. “Chewing gum can also cause wrinkles to form around the mouth, as well as create other issues in the mouth structure. 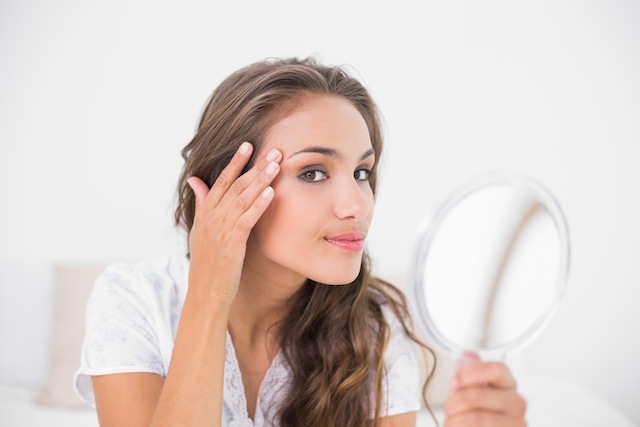 Breaking these habits will help prevent premature lines and other signs of aging!” says dermatologist Dr. Joel Schlessinger. Dry lips are uncomfortable, but licking your lips is not the best solution. Saliva dries, taking any natural moisture with it, says Dr. Schlessinger. The result is dry, cracked and chapped skin.